She noted also that in St Vincent and the Grenadines, persons need to place more emphasis on their diets, as doing so can mitigate the high incidence of illnesses, including diabetes, hypertension and heart disease. She said that a childâs first eating experiences, breast feeding and complementary feeding, go on for a lifetime and while some persons eat for enjoyment, from a health perspective, eating is for formation and maintenance of the human body and for mental health. âIn the household, nutrition is just getting up every morning and deciding what you want to eat. Some of us plan a lot beforehand and many of you donât and what we would like in the Nutrition Unit is to have a more intentional impact, where people think more about what they eat every day,â said Robin. She added that the Unit pursues its goal of spreading proper eating habits through many outlets, including media messages and a number of programmes in the health sector. She said that through surveys and surveillance, they are finding out more and more that specific health problems are related to lack of nutrition, poor nutrition and under nutrition. Robin said that most persons think that the term malnutrition, only refers only to poor nutrition, but that is not the case, as malnutrition also refers to the effects of bad nutrition, like kwashiorkor, marasmus, wasting and stunting. 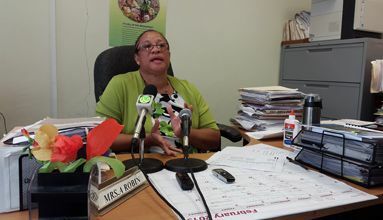 She said that in reality, there is a lot of what we call hidden hunger and poor nutrition in St Vincent and the Grenadines, with the major one being iron deficiency/anaemia, specifically in pregnant women, infants and children. She said also that childhood obesity is a problem and many people do not see that as malnutrition, but it is in fact a form of malnutrition. In attacking these issues, Robin said that different models exist for operation, as a staff of nutritionists, dieticians, community nutrition officers, food service supervisors and other committed workers meet and plan on a daily basis. Robin added also that while a lot of data is available for the under-five populations, surveys and surveillance need to be carried out for older age groups, but the main problem is the lack of human resources to do the work. She added also that as it relates to the older population, they have just completed the national health and nutrition survey, which gave an idea of what adults 18 to 69 are eating. âBased on this information, we plan intervention programmes in different communities, as well as we work through the Ministry of Healthâs primary health care system, working with health centres and anti-natal health and diabetics. We also provide hypertensive clinics to provide medical nutrition therapy and nutrition care to clients who are referred by doctors or nurses,â explained Robin. She added also that at the Milton Cato Memorial Hospital (MCMH), there is a dietetic department which is manned by a dietician and health care is provided to in-patients and out-patients. Robin added that they do a lot of work helping persons to manage their conditions. Robin noted that the challenges include the volume of work to be done, compared to the human resource available for use in the Unit, the high cost of fruits and vegetables and the fact that persons do not take certain foods in moderation. âA lot of persons say Iâm going to die anyway, but you do not want to die the way some people are dying right now and donât want to die before your time and before you have finished providing for your family,â said Robin. Robin is encouraging persons to pay more attention to what they eat, as well as food labels on imported foods. She is also encouraging more physical activity and the eating of fish.